Mix all ingredients in a food processor until a thick paste. 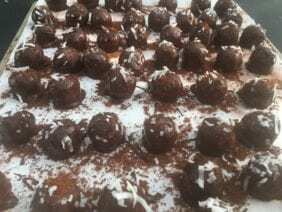 Roll into small balls and dip in melted chocolate with a bit of creamed coconut. 1 Tbsp. creamed coconut to 1 lb. chocolate chips. Sprinkle with toasted coconut, a pinch of Himalayan mineral salt, and/or a bit of dried rose petal. Roll in the unsweetened coconut flakes, if you’d like. Each batch makes about 20 – 30 truffles depending on size. They freeze well and can be kept frozen for a month or so. powdered og. cocoa, shaved coconut and nettle salt for sprinkling on the truffles after dipping in the melted chocolate. Please note that the rosehip mass that I used came from straining my rosehip honey, which I had preserved by freezing. After thawing, the rose hip mass was pulsed in a food processor until ground. If using dried rose hips, soak them in warm water until soft. While pectin and sugars will be present in the mass, the Vitamin C and antioxidants will not as they are destroyed in the drying process. These turned out almost cake-like. 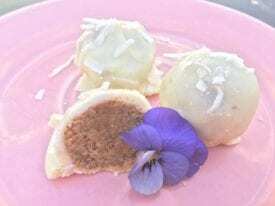 Herbal petit fours, if you will. Coconut for sprinkling after dipping in the melted chocolate. Crushed cacao nibs, chopped raisins or figs. Put a fresh blueberry or raspberry in the middle of each ball! Add a ½ tsp. bee pollen to the mix. How about flax and sesame seeds? Almond and rice flour. 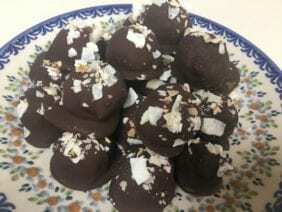 Or how about rolling the balls in powdered baker’s chocolate? The point is to make it fun and tasty, herbal and healthy. Let your imagination go, the possibilities are endless! If using fresh fruit, refrigerate and eat within a couple days or freeze. Energy and anti-inflammatory: Nettle powder and bee pollen. Willow honey. Stress and anxiety relief: Wild rose, lavender and/or hawthorn honey and elixir. Cough and cold relief: Cough and cold elixir, of course! Grindelia honey. Balm of Gilead (cottonwood leaf bud) honey. For instructional info for making herbal honeys and elixirs, go to our Herbal Medicine Making Tutorial.